Deluxe indeed! This multi-stage car adapts to a child’s growing skills from ages 12 months to 3 years, which is fun for both the child and parent. Electronic Activity Center: The fun electronic activity center with fun melodies and animal sounds can also be removed from the car and attached to a crib or stroller. 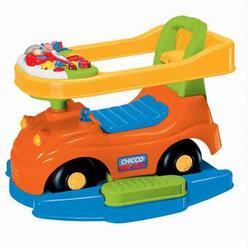 Rocker: Have great fun with the rocking base, and for extra safety “Play ‘N Ride Car Deluxe” features a safety bar. Push and Walk: Parents can push along and guide children as they ride along, and for extra comfort there’s even a footrest. Sit ‘N Ride: Remove all the car’s accessories to reveal a child’s first Sit ‘N Ride Car! 2 x AA 1.5V batteries (included) Award Winning Toy!